Some 11,000 years ago during the last Ice Age, elephants living on mainland Europe travelled further and further down the stretch of land in search of food. At one point they reached the tip of Italy, the land which is now known as Sicily. When the food became scarce even there, the elephants, together with other migrant animals, crossed an ice passageway created by the falling temperatures and came over to what is now Malta. Archaeological remains show us clearly that these elephants lived in the area of Għar Dalam in Birżebbuġa, quite possibly because the deep valley there was fertile enough to provide them with food, and the surrounding caves with shelter. Eventually, several genera­tions later, the ice bridge between Sicily and Malta melted and these exotic animals were trapped here. With limited space and dry spells, the elephants died out slowly and became extinct on the island. I’m thinking that elephants these days might no longer live in the Għar Dalam valley, but they certainly live in several Maltese buildings – it’s just that we don’t see them. Wait, that’s not exactly right. We do see the elephants, but we pretend not to. The other day I asked why Malta as a nation tops the list of EU countries that spends most on restaurants and hotel weekend breaks? I think we finally have the answer. Because we need to run away from the elephant sitting on our sofa, or on our office desk, or the one that is about to squeeze us further against the walls. It could be something we possibly inherited from our Għar Dalam ancestors – who didn’t mind sharing their cave with the giant animals – but it is fascinating how Maltese people would rather live crammed in corners rather than face the elephant, tell him he’s being ridiculous and kick him out of their spaces. And so it is that this will always be an island were elephants reign. In rooms. Some linguistic background here: the expression ‘the elephant in the room’ was coined in 1814, by a Russian journalist, Ivan Krylov, in his fable called The Inquisitive Man. His story is about a man who goes to a museum and is fascinated by all sorts of little microscopic things on display there but fails to notice a huge, massive elephant on display. Within a hundred years, the expression had travelled out of Russia and become very popular. In 1935, comedian Jimmy Durant, starring in a Broadway musical, had this act in which a police officer stops him while leading a live elephant on stage. “What are you doing with that elephant?” the policeman asks the comedian. The act always brought the house down. 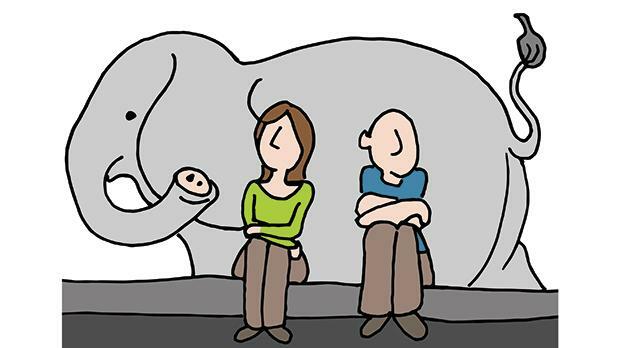 By 1959, The New York Times was regularly using the phrase ‘the elephant in the room’ as a metaphor to refer to blatant controversial issues – most often political or social – which would be obvious to everyone but which are deliberately ignored to avoid great embarrassment. I do not believe we have an equivalent of the metaphor in the Maltese language.